More than 60 percent of the U.S. population is defined as being overweight or obese. Lack of sufficient exercise and consumption of higher-fat and -sugar foods often contribute to weight gain and can result in an individual becoming overweight or obese. Rush Food and Nutrition Services managers are concerned about these statistics and are excited to introduce healthier options in the vending machines around the Rush campus. What began with the vending machines in the Tower is now expanding to other vending machines across Rush University Medical Center. We partnered with our vending supplier, Ace Vending, to increase the number of Health on the Go items in snack machines to half of the items currently offered. These snacks meet Health on the Go guidelines, featuring reduced calories, fat, sodium and sugar, and increased fiber. Half of the cold beverage options will be juice, water or sugar-free sodas. The cold food machines will feature more salads and entrees, which also will meet Health on the Go guidelines. To help those on our campus make more informed choices from the vending machines, nutrient information for all vending items will be available electronically through new MIND (Make Informed Nutrition Decisions) screens that will be attached to machines in several of our vending locations. When we launched the vending program in the Tower, we also introduced differential pricing, which allows customers to purchase healthier snacks and beverages at a lower price. This pricing strategy appears to be shifting snack purchasing practices to more healthful items. In our traditional machines, approximately 19 percent of snack purchases were the Health on the Go items; in the Tower machines, these items now account for 46 percent of purchases. Food and Nutrition Services strives to provide the very best food and service to our employees, students, volunteers, patients and guests. We are excited to enhance our vending program across campus. Mary Gregoire, PhD RD LDN, is director of Food and Nutrition Services at Rush University Medical Center. 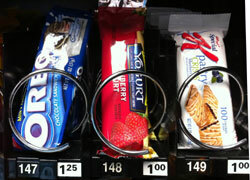 This entry was posted in Food and Nutrition and tagged healthy foods, junk food, snacks. Bookmark the permalink.